Trading to Win - Stock Market Views and Trading Ideas based on the mix of Technical Analysis and "Funny-mentals" by DavidDT using Tom DeMark Indicators Trading to Win: Recap of today's posts on "Regular Contributors Site"
Recap of today's posts on "Regular Contributors Site"
GS might stage rally on Monday? Just a thought - that is why after the close. The WORST of any coal company, but somehow I have a gut feel ( or think I do) that it just might be decent replacement for cowardly dropped BTU position. Decided to hold all new positions, including few GLD Nov71puts ( @1.80) over weekend. Yesterday's miscalculated QQQQ down target when I had to leave after 2 PM, order was set for 30.17 was not reached by just 23c, well, money not made in this market better than money lost. Bummer... (should I be watching QQQQ action I would buy 10 Nov31calls @.80+ when qqqq was at 30.50 reversing to the upside - another good 60% profit missed. BTU stop at 28.07 set due to the same reason ( business meeting) took me out of otherwise profitable trade ( today's high 30.06, so reasonable sell would have been 29.80 - on $20000 position (about 700 shares) - $1000 not made. Due to this morning meeting missed sell point for EXM at about 11.40+ - another $1000 not made. Why am I talking "coulda-shoulda- woulda" when it makes no difference? 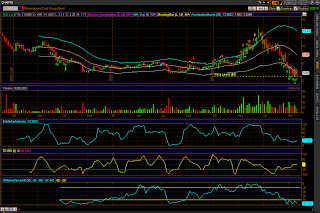 blue dotted line is CMF14 ( Chaikin Money Flow ) centerline - looks like more distribution to me. on hourly yellow line - my expected down target yesterday. So far looks like $VIX might stop climbing after 2PM. It plays well with "sell before weallllly bad Friday's jobs number"
I will be monitoring QQQQ calls I intend to buy - will have to decide if it has to be done today or tomorrow first thing in the morning. The problem with "buy today" for me is that I will have to leave for busyness meeting at 2PM - might not make it back in before 4PM. I'm reading: Recap of today's posts on "Regular Contributors Site" $$Tweet this!